The Space PencilEliminate The Muda! You may have heard of the famous space pencil? In the early days of the space program NASA realized that in the absence of gravity, with no up and no down, a conventional writing pen would not work. They needed a writing implement that could work even if upside down. NASA put the best and the brightest minds to work solving this dilemma. After spending months of effort and a mere $1.5 million the Fisher Space Pen was born. This article was featured in the Festival of Frugality hosted by Think Your Way to Wealth. Please check out this festival for many other great articles about personal finance. At the same time, the Russians were struggling to maintain their lead in the space race. They too were faced with this challenge. They however took a more simplistic approach to solving this problem. Instead of spending millions of rubles and diverting their scientists they used a pencil! This story illustrates a trait that is all too common for humans. Surrounded by all sorts of gizmos and gadgets we too often look toward latest and greatest; and routinely the most expensive technologies to solve our problems. Often it originates with a genuine need, sometimes it is a want and occasionally we have no choice but to spend. Regardless of the prompt, frequently people buy more and bigger than they really need. People buy too much power; computers with a 2.5 GHz processor and a 1 Terabyte hard drive to send and receive e-mails. People buy too much capacity; they own three cars when there are only two drivers in the house. People buy items with more features than really needed; some digital cameras come with instructions booklets that are bigger than the camera itself. People buy bigger than necessary; picking up a 62″ flat screen TV for a room that is only 12′ x 12′. People buy technology that rarely gets used; bread makers and treadmills have to be at the top of this list. Taking a moment to consider the financial investment in stuff we buy, we routinely waste our money on the excess and the unnecessary. As I pondered this post it came to mind that especially with technology we are simply paying for someone or something else to do things that we once did ourselves. Has our society become desensitized to DIY? We use to knead bread and whisk our own batters, using the same recipes yields the same results. How many of the features on a digital camera do most of us really use? I point and shoot with auto focus and auto flash. 99% of the time the picture is great for personal purposes. Is the biggest and fastest always the best choice? For the vast majority of computer applications 2 year old processor capacities are sufficient and unless you are editing feature length movies it would be difficult to fill up even a half a terabyte of storage space. The next time you are in the market for a camera or a baby carriage, after you have reviewed all the options take a step back and ask yourself if you really need the latest and greatest. A Monte Blanc is really nice but in the end won’t a Bic pen do? Readers – Truth or dare… what gadgets and gizmos do you have lying around the house that you have never really used? If you are not going to tell the truth in the comments below, I dare you to donate them to a worthy cause! I have never understood the draw (hee hee) of expensive pens. At my worst consumerism point, I still used whatever I could find that made letters.I have known people, though that would spend piles of money on a pen, though. Adn it’s not just technology, the same thing goes for purses. I like them to go with my clothing, and look nice, but I can’t figure out why someone will spend 600 bucks on one. I have known young 20 something girls who were struggling to make ends meet in college, but carried Louis Vuitton. A friend and I were laughing the other day about how attractive the new Apple Tablet was to us, though we had no reason (and no funds) to buy one. We both realized the advertising was part of it, and our Star Trek Geek upbringing added to the allure, but we realized it was too expensive and not necessary in our lives. Still, the idea gave us a giggle. .-= Tracy´s last blog ..Eco Fraud Friday: Please Don’t Poison The One’s You Love =-. I’m somewhat of a minimalist when it comes to technology purchases (it’s funny, considering that I’m a techie), so I don’t really have much (I don’t even have a cell phone, I use the one from work). In fact, I really don’t purchase hardly anything for myself! We have a plastic food wrapper/sealer device bought 2 years ago and my wife has never used it. Gonna try to get her to part ways with it. @Tracy – Funny about the purses, the other day at the airport I overheard a young lady talking about a purse that she got “on sale” for only $400! I almost choked! @MonyReasons – We have our own share of kitchen gadgets yet do almost everything by hand… even cleaning dishes. Crazy! @Ken – Good luck! I’ve been working on an Ice Cream maker for 2 years. She is getting weak! I actually had a genuine Fisher Space Pen years ago and I have to say what a waste of money that was – I was infatuated with the idea of owning a Space Pen but never asked myself when I would find it necessary to write upside down. You’re right, buying the biggest and fastest of anything usually isn’t necessary unless you can justify it for at-home work. I get by with $500 middle of the line laptops, and my kids all have hand me downs except for my son who bought a nice Dell laptop for his college engineering classes. I splurged on my washer and dryer but I made sure the I was actually going to use all the extra features before I made the purchase (and they were on sale). @David – Reading about Fisher brought back some childhood memories. I always wanted one of those too. I’m with you on only buying what you need, I just wish it didn’t take me so long to figure it out! This would be a great story if it was true. 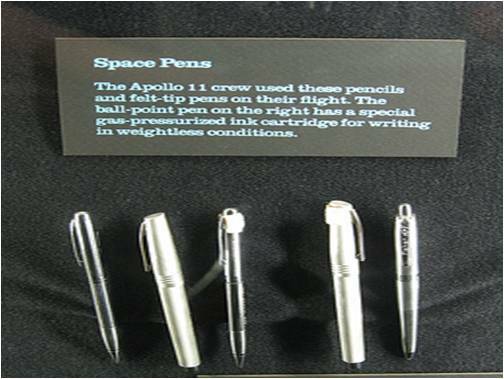 The space pen was developed by Fisher independently and prior to the needs of NASA. After two years of testing NASA adopted the pen for its space program and purchased them from Fisher at the outrageous cost of $2 per pen. Yes, thats TWO dollars. It was the lucrative association to the space program that gave rise to the sales of these pens, and make the Fisher space pen an icon. Not a single government dollar was spent developing these pens, all research money and time was at Fisher’s expense. And as for the Russians? Last time I checked their pencils still haven’t gotten them to the moon…..
@ Nicholas – You are correct, the Fisher space pen story is a construct to illustrate government waste. Hearing things such as this also makes us question the $700 toilet seats and $400 hammers. Yet I doubt any one questions waste in our government, the pen fable is thought provoking. The real message and intent of this blog however is not what the government does or does not do, it is what we do with our money. I would ask you to look past the opening and consider the individual expenses you incur, have you ever made any of these mistakes?